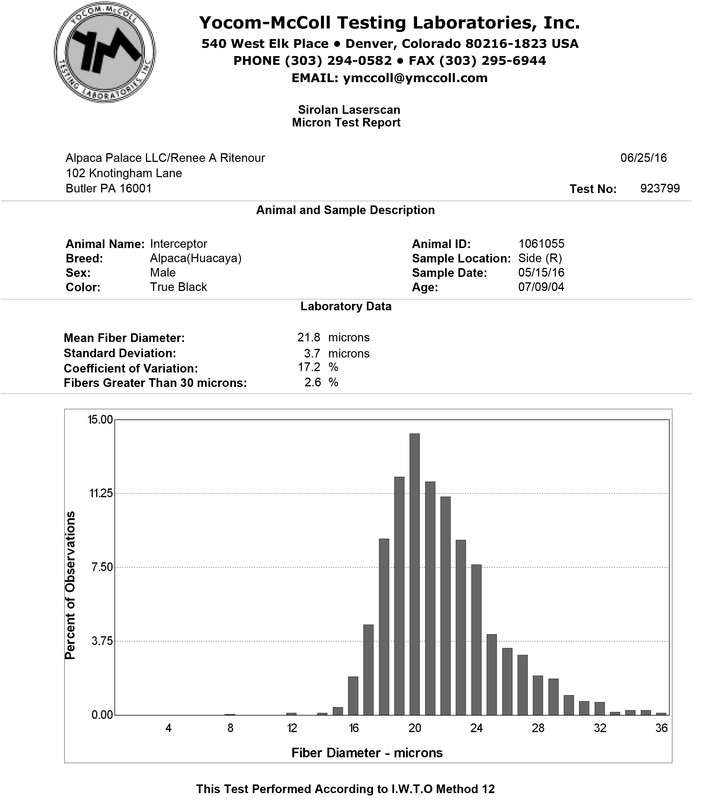 2015 AFD 22.1, SD 3.7, CV 16.6, >30 2.2 Breeding 11yr Black Male! Interceptor is a super fleeced 1/4 Accoyo black male. He is one of the FINEST, CRIMPIEST, Black Herdsires we have seen to date! He is a son of the nationally known Dark Shaddow who was the Reserve Futurity dark herdsire of the year in 2006. 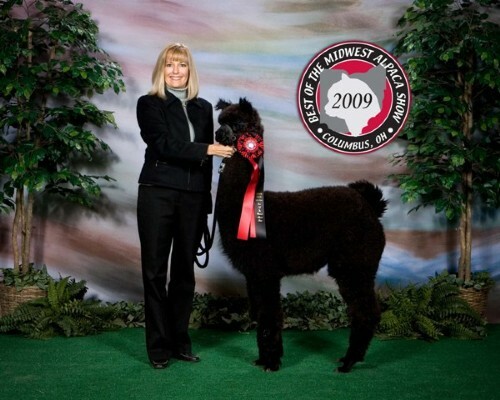 Interceptor carries genes that include; Black, Gray, Fawn and White colors and a super fleece that has certainly proven its worth in the show ring. Interceptor's Dam, Platina De Peru is a fine gray female with a very tiny, fine-fleeced crimp which she passes on to her offspring. 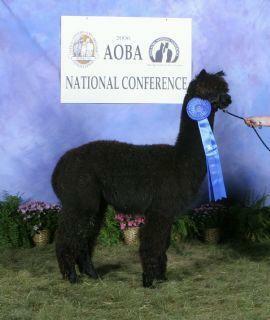 He has produced one of the nicest grey females, multi-Champion, 2X Judges Choice, Morning Sky's Paulina. 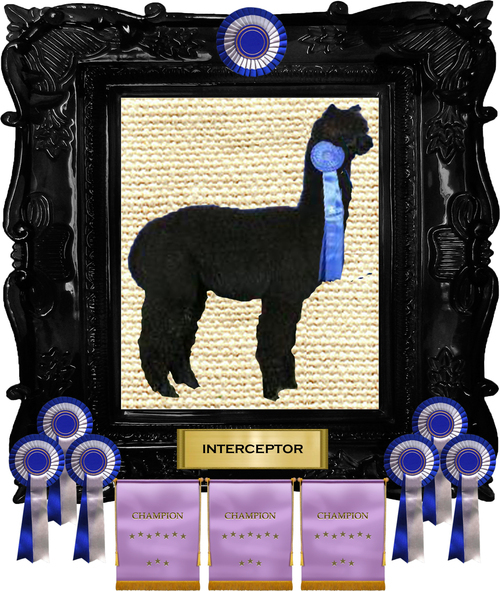 With his very upright conformation, super crimpy fleece and dense coverage, Interceptor has won time and again in the show ring. He has passed is exceptional fleece traits onto his wonderful offspring including Sunset Hills Izzie and Sunset Hills Voyager. This is a wonderful opportunity for you to enrich your herd with some exceptional color genetics along with a fine crimped fleece. 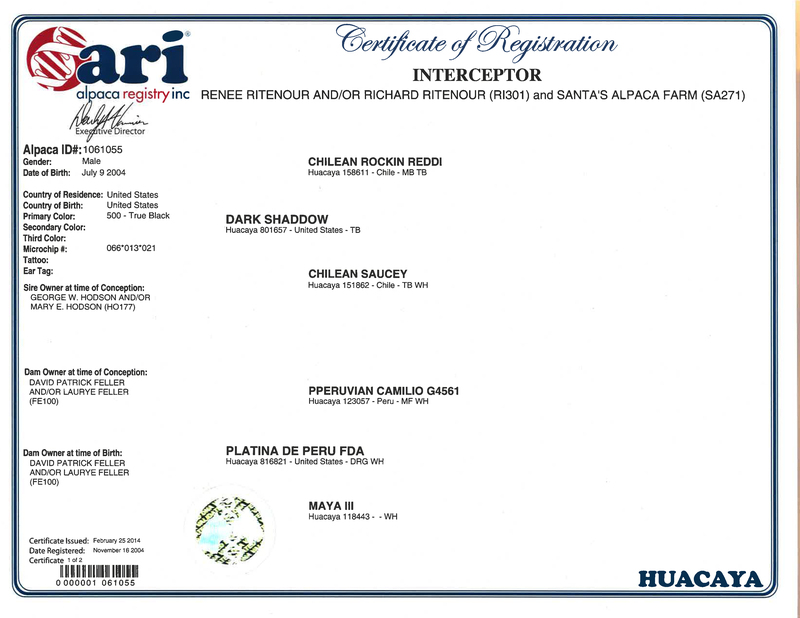 Peruvian, Chilean and Accoyo genetics, Interceptor has it all!